Please Note: If you are having trouble with the website it could be that your personal computer firewalls and security settings are set high so it will not allow the website to process or move forward with the booking. Please lower the security settings while making a booking then change it back to high once completed. Also, those computers that are using Windows XP and Internet Explorer 9 or lower may have trouble with the website as these systems do not update and may not be capable to handle the website. Please update your computer to Internet Explorer 10 or higher. Please do not use the “Notes” section to try to book a marina slip or the Group Camping area. These reservations will be accepted by e-mail only. If you are booking for one month or longer, you can start making reservations using the Online Reservation System on January 15, 2019 at 9:00am. If you are booking for less than one month or any length of time, you can start making reservations on the website February 01, 2019 at 9:00am. The map shows you all the sites and information about the sites. In the drop down menu you will choose you type of site (15 amp or 30 amp), then you will choose your Start Date (date you wish arriving) and your End Date (date you are departing). These dates are in dd/mm/2019 format. You will then choose your Site Number. The Picture below does not show the full map, and you will have to scroll down to bottom of the page to click Next. If you are having trouble finding an available site, there may not be any availability. 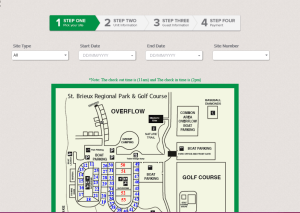 Try leaving the Site Type as All, then enter the Start Date and End Date and the map and list will show you all available sites for that time. 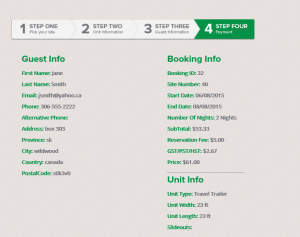 In the drop down menus, you will choose the type of unit (motorhome, 5th wheel, etc. 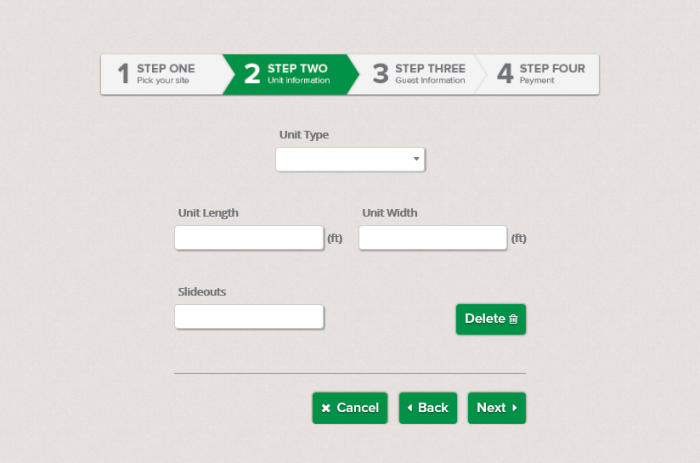 )​, you will enter the length of your trailer, the width of your trailer and the number of slideouts, then you will click Next on the bottom of the page. 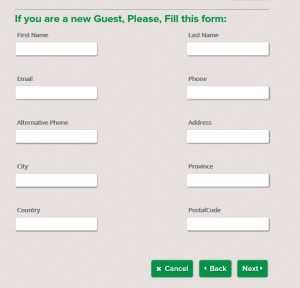 The first time you make reservations, you will have to enter all your contact information. Every other time, you will need to login with your username (e-mail address) and password. Click Next on bottom of page. While booking a site, there is a 10 minute time limit while entering information as the site and dates are held for these 10 minutes while you are booking it. 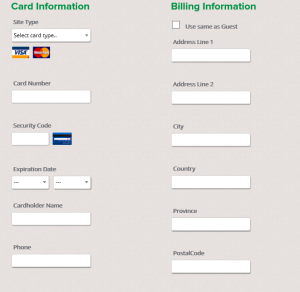 You are required to pay for the site in full at time of booking. If there are any problems or mistakes while booking a campsite, look for red printing to indicate where the mistake is or what is missing. 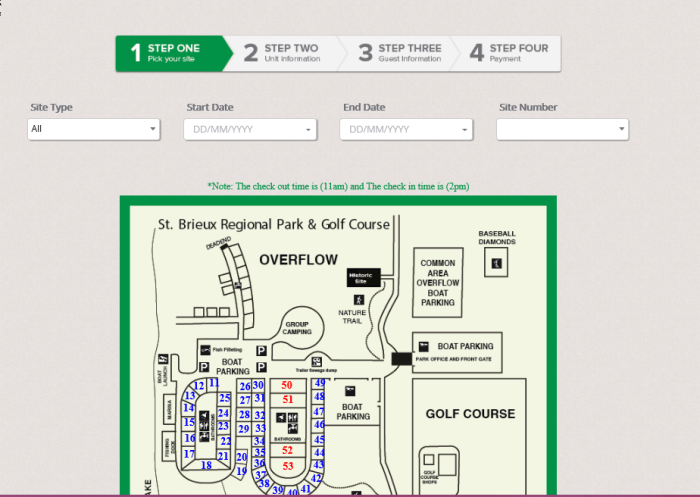 If you have any major issues while booking, please e-mail us immediately at stbrieuxregionalpark@gmail.com. To change your password, hover over your name in the upper right hand side of the page and select “change password”. To edit your information, click on your name in the upper right hand side of the page and select “edit your information”. If a site is unavailable for reservation, it might be that the site is already booked, it cannot allowed to be rented for length of time you are requesting, or it is unavailable for reservation. If you want to change your confirmed reservation, such as date of arrival, date of departure, or reserved campsite, a $10.00 change fee will apply and possibly other fees depending on when you make these changes and what changes are made. Please see our Reservation, Cancellation, and Refund Policies page for more information. 2. The page will display all your confirmed reservations, find the reservation you want to make changes to and click on the Pencil Icon to the right of the particular reservation. 3. The Editing process takes you through the booking process again, so you can change the arrival or departure date with the drop down menus, or the site number with the drop down menu, on the first page, then click on the Next button at bottom of page. 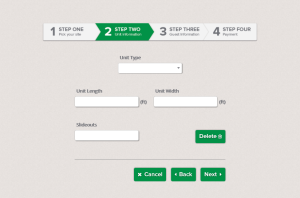 This will take you to the trailer unit details if you want to change this information you can do so or you can click on the Next button at bottom of page. 4. The final page will give you the details of the changes you made. It will give you the refund/payment details. You will choose a method of payment for the refund/payment, accept Terms & Conditions then click on the Save Button to confirm your changes. 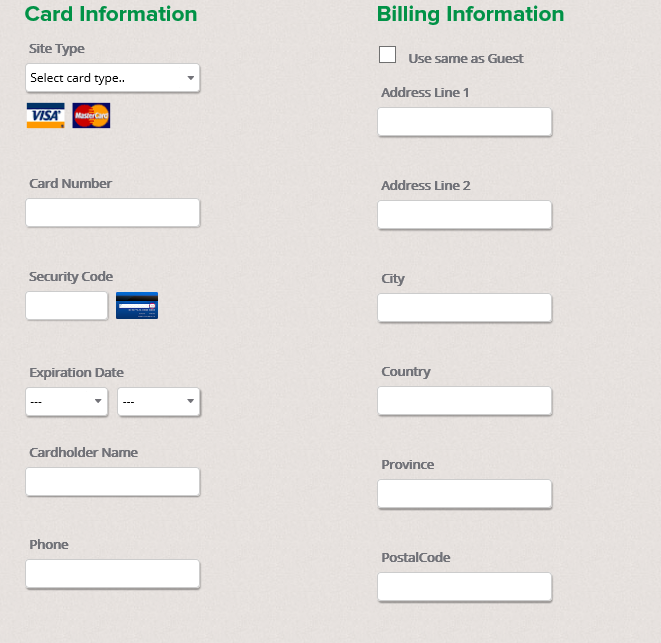 This will process the refund/payment and confirm your changes. At anytime during the editing process you can click on the Cancel button to stop making changes. 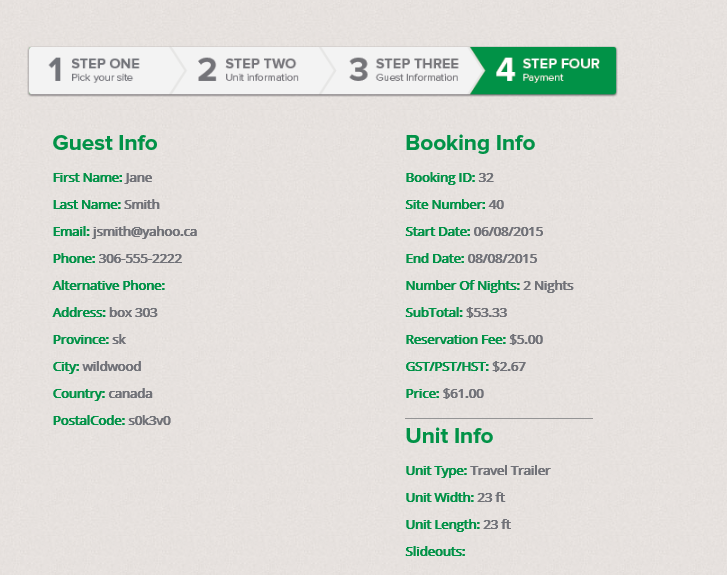 This will take you back to your home page of your confirmed reservations. If you want to cancel your confirmed reservation completely, there is an automatic $25 fee, and possibly other fees depending on when you are making the changes, please see the refund polices for more information. 2. This page will display all your confirmed reservations, please find the one you would like to cancel and click on the X icon to the right of the reservation you want to cancel. 3. This will take you directly to the final page, give you details of the refund amounts, you need to choose a payment method for the refund, accept Terms & Conditions, then click on Cancel Booking. 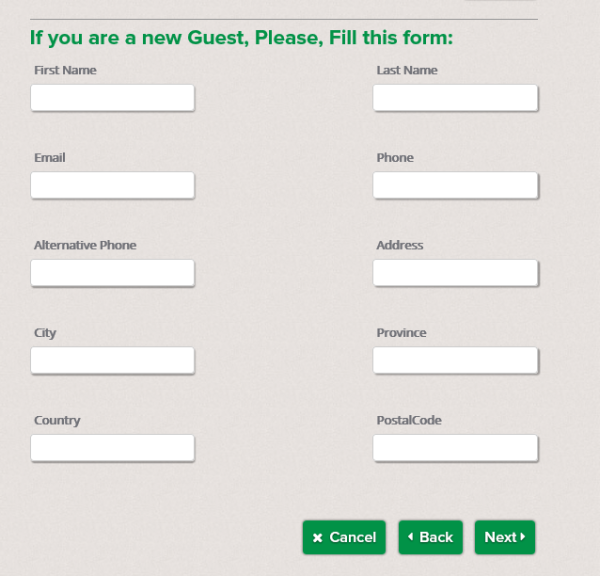 This will process the refund and cancel your reservation completely. At anytime during this process, you decide you do not want to cancel your reservation, please click on the Cancel button at bottom of page and it will take you back to the page of your confirmed reservations.